Although most of the country is still digging out and cleaning up from a historic winter storm, commonly referred to as the “Groundhog’s Day Storm”, I decided to go ahead and answer the Question of the Week regarding Storm Prediction Center (SPC) Moderate and High Risks. I took the polygon outlining the first Moderate [High] risk during a given year, regardless of time of issuance. This means I treated a 12 UTC issuance the same as a 1630 UTC issuance and 2000 UTC issuance. I took the risk polygon, placed it on a 4km grid (specifically grid number 240), and activate all grid points that fell inside the risk polygon. This left me with a grid of 1′s (inside outlook) and 0′s (outside outlook). I created a grid for each year and then summed all the grids together. This gave me a grid containing the number of times each grid point was within the first Moderate [High] risk of the year. I then divided each grid point by the number of years I was examining. 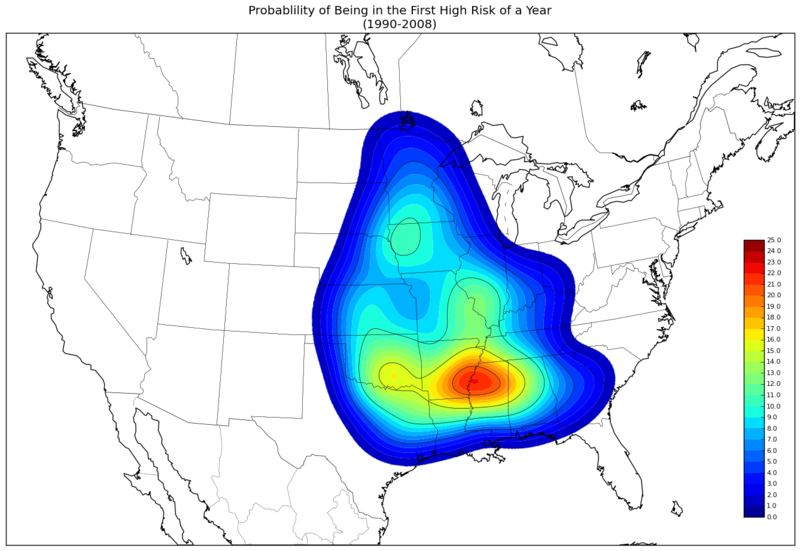 This left me with the probability that a grid point would be contained in the first Moderate [High] risk of the year. The resulting plots were extremely blocky because of the straight edges of the outlook polygons and the relatively small size of the resulting sample size (19 years for Moderate risks and 18 years* for High risks). In an attempt to better retrieve the underlying probability distribution, I employed a technique called Kernel Density Estimation. I used a gaussian kernel with a bandwidth of 120 kilometers (per Brooks et al. 1998), and extended the resulting distributions out to 5 standard deviations. To determine when the first Moderate [High] risk is typically issued, I converted the day and month of the first Moderate [High] risk into the corresponding day of year (e.g., 1 July is the 182 day of the year). I then took the mean day of the year and converted it back to day and month. This means that the average first issuance of a Moderate [High] risk may not fall on a day that actually had a Moderate [High] risk issued. For this analysis I only evaluated the years between 1990 and 2008. This is because in the early years of the National Severe Storms Forecast Center (NSSFC) / Storm Prediction Center categorical risks had a different meaning than they do now. Thus, I tried to limit the analysis to relatively current definitions. In the graphics below, the colored contour intervals are every 1% and the thin black contours are every 5%. 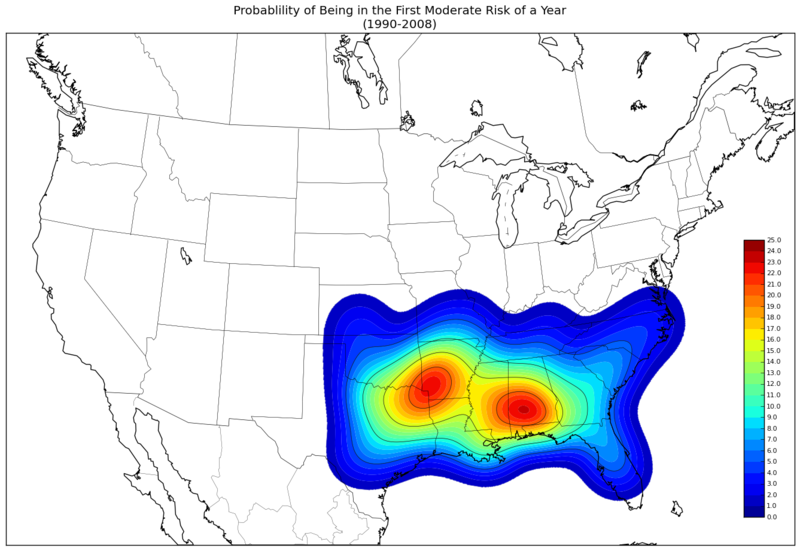 Climatologically, where is the most likely location to experience the first SPC Moderate Risk of a given year? There are actually two areas when using the raw probabilities: southwest Arkansas and southern Alabama. However, when applying the kernel density estimator, the area in southern Alabama has a slightly higher probability. As for when this first Moderate risk is issued, the average first issuance is 28 January. What about High Risk? There is actually more variability (both spatially and temporally) in the issuance of the first High risk than the first Moderate risk. This is most likely the result of the greater variability in time of year, and thus greater variability of the large scale pattern. High risks have been issued as early as 21 January (1999) and as late as 1 July (1997). [Technically it has been issued as late as never, because 2000 did not have a single High risk issued.] For early High risks, the favored location is in the southeast United States where the ingredients that favor severe thunderstorms is more often confined to the Gulf Coast areas. Later in the year, more northern locations are favored as the cyclone track, and ingredients for severe thunderstorms, lifts northward. With this said, the first High Risk is typically issued across portions of southeast Arkansas and northern Mississippi between 27-28 March. *There were no High risks issued in 2000, thus only 18 years of data were used to calculate averages regarding High risks. Therefore the resulting graphics and statistics should be considered conditional statistics, meaning these statistics assume a High risk will be issued during a given year.